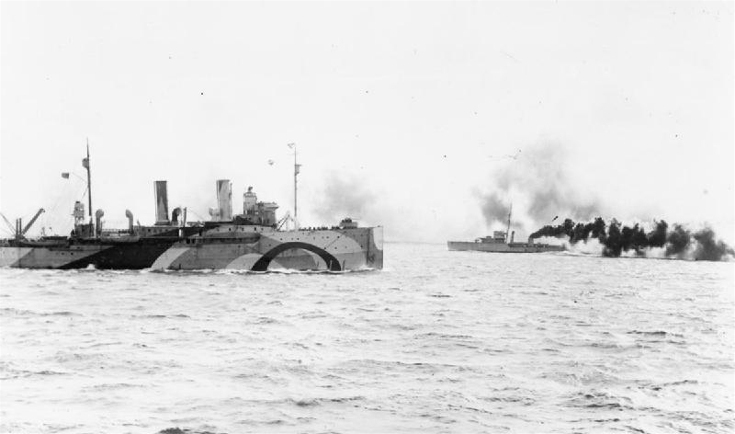 The destroyer HMS Vampire laying smoke, whilst protecting the USS Shawmut, of Mine Squadron One, operating from Invergordon. The photo (IWM Q20259) was taken on 20 September 1918 during a suspected submarine attack in the North Sea. American ships laid 56,000 of the 71,000 mines in the Northern Barrage, which stretched from Orkney to Norway. At this time, the Americans referred to Invergordon as Naval Base 17 and Inverness as Base 18.